The Grid is made up of several clusters. Each individual Grid service resides on a particular cluster. Each cluster is broken down into "storage segments", where the data for these services is stored. This guide will show you how to find your cluster and storage segment in the Server Guide page of the (mt) Account Center. 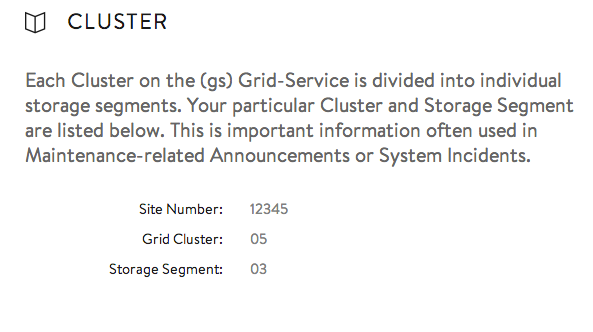 Please note: The cluster is the permanent home for your Grid, while the storage segment is subject to change. That being said, the relative site or system paths will not change. Click on the Admin button next to the service you wish to administer. In your Server Guide, click the Cluster option in the menu at the left side of the screen. You should now see a page displaying the Grid Cluster and Storage Segment for your Grid.